Our iGEM research project involves developing a framework for the implementation of genetic manipulation techniques'specifically, multiplex automated genome engineering (MAGE) and CRISPR-Cas9 systems into non-model, environmentally significant microbes. 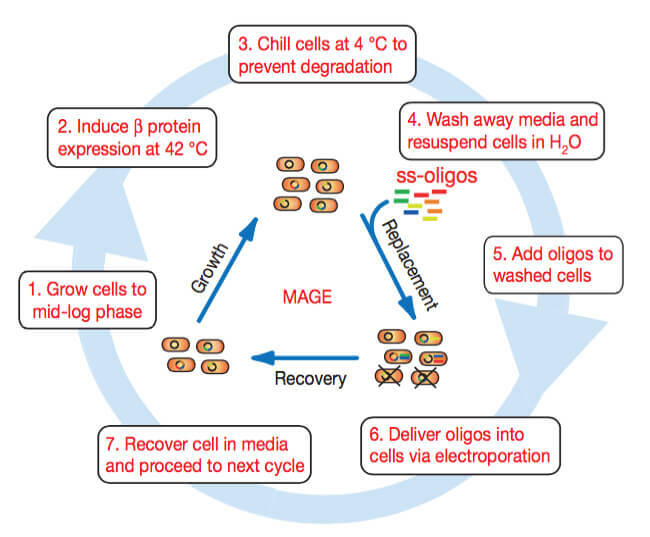 MAGE was developed as a rapid, high efficiency tool for increasing the genetic diversity of a cell population at targeted loci within the genome, and has so far been ported into the model organism Escherichia coli and a few other members of the family Enterobacteriaceae (unpublished data). CRISPR (clustered regularly interspaced short palindromic repeats)/Cas systems, based on prokaryotic adaptive immunity mechanisms, have emerged as a powerful cleavage-based genome editing technique (Cong et al. 2013). The organisms we used to develop our framework are Rhizobium tropici CIAT and Synechococcus sp. PCC 7002. 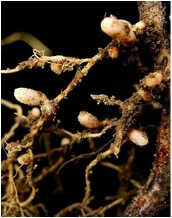 Rhizobium tropici CIAT 899 (hereafter RT-CIAT) is a nitrogen-fixing bacterium capable of forming root nodules with certain legume-producing Leucaena and Phaseolus trees (Martinez-Romero et al). Synechococcus sp. PCC 7002 (hereafter PCC7002) is a fast-growing marine cyanobacterium capable of photosynthesis and free fatty acid (FFA) production (Ruffing 2014). Multiplex automated genome engineering (MAGE) is an iterative, oligonucleotide-mediated genetic manipulation developed by the George Church lab at Harvard Medical School in 2009 (Wang et al. 2009). The technique relies on the introduction of degenerate (randomized) ssDNA oligos into a bacterial cell. The oligos are designed with 30-45 bp homology arms that are complimentary to the target sequence in the cell's genome up- and downstream of the degenerate sequence. Phage homologous recombination proteins Gamma, Exo, and Beta (Lambda-Red cassette) are induced, and allow the oligo to anneal to the lagging target strand as the cell's chromosome separates into single strands for replication (Gallagher et al. 2014). Desirable genotypes are then selected based upon a phenotypic change in cell populations. MAGE can be used to optimize biosynthetic pathways which are then selected for based on a desirable phenotype. In the past several years, CRISPR-Cas systems have emerged as an extremely powerful gene perturbation and genome editing technique. Based upon the RNA-guided restriction endonuclease Cas9 from the microbial adaptive immunity system CRISPR (clustered regularly interspaced short palindromic repeats), these systems allow virtually any sequence within a cell's genome to be targeted (Hsu et al. 2014). The Cas9 protein relies on a 20-bp guide RNA (gRNA) sequence to base-pair directly with a DNA target. Once this occurs, Cas9 creates a double-stranded break (DSB) upstream of a sequence referred to as a protospacer-adjacent motif (PAM). The PAM sequence is unique for every organism which possesses a CRISPR system. In a native CRISPR system, the gRNA is typically a sequence derived from a viral genome which is used to cleave foreign DNA if the cell becomes re-infected with the same virus. The CRISPR-Cas9 system's power as a genetic editing tool arises when the gRNA is used to target endogenous DNA. The Cas9 protein from the bacterium Streptococcus pyogenes is typically used, since its PAM sequence of NGG (where N = any nucleotide) allows the protein to create DSBs at a large number of loci (for instance, the sequence NGG occurs every 8 bp on average within the human genome) (Cong et al. 2013, Hsu et al. 2014). Synechococcus sp. PCC 7002 is a marine cyanobacterium capable of rapid growth in a wide variety of environmental conditions (Song et al. 2015). The bacterium was first isolated from the waters off Magueyes Island, in southwestern Puerto Rico, in 1962 (Ludwig and Bryant 2012). The doubling time of PCC7002 in optimized, CO2-enriched conditions is under 3 hours, making the organism an ideal model for photosynthetic prokaryotes. PCC7002 is also a prime candidate for genetic modification: The organism's genome is fully sequenced (NCBI Taxonomy ID: 32049), its metabolic pathways are well-characterized (Hamilton and Reed 2012), and a system for protein overexpression has been developed for PCC7002 (Xu et al. 2011). Since it is native to marine environments and grows readily in seawater, the use of PCC7002 as a large-scale producer of small molecules would not place a burden on increasingly limited freshwater sources (Ruffing 2014). PCC7002 is naturally competent and readily undergoes homologous recombination with linear DNA fragments (Widger et al. 1998). Rhizobium tropici CIAT 899 is a promiscuous α-proteobacterium first isolated from a common-bean nodule in Colombia (Martinez-Romero et al. 1991). As a Rhizobium species, CIAT 899 can fix atmospheric nitrogen into a form that can be absorbed by plants, thus reintroduce nitrogen as an essential nutrient into the soil (New Mexico State University 2005). Rhizobium must nodulate plant roots in order to fix nitrogen, and although some Rhizobium species can only nodulate a limited number of legume species, CIAT 899 can establish nitrogen-fixing symbioses with a broad range of legume hosts (Hungria et al. 2000). CIAT 899 is more environmentally adaptable when compared to other Rhizobium species due to its tolerance of stressful conditions such as acidic soils and high temperatures (Graham et al. 1994). It has also shown resistance to various antibiotics, pesticides and fungicides (Bernal et al. 2004), all of which are properties that have led to CIAT 899's commercial use in inoculating the common bean Phaseolus vulgaris in South America and Africa (Ormeno-Orrillo et al. 2012). Because nitrogen-fixing legumes reduce reliance on synthetic fertilizers that are costly and ecologically damaging, scientists have recognized the role of Rhizobia in agricultural sustainability and ecological preservation (Balkan 2007). We have improved the characterization of three previously existing BioBricks, namely three of the Anderson Promoters: BBa_J23100 (Anderson Strong), BBa_J23111 (Anderson Medium), BBa_J23114 (Anderson Weak). We assembled these three promoters to citrine and the T7 terminator, and then ligated the constructs into two different vectors that could be transformed into R. tropici and S. meliloti. 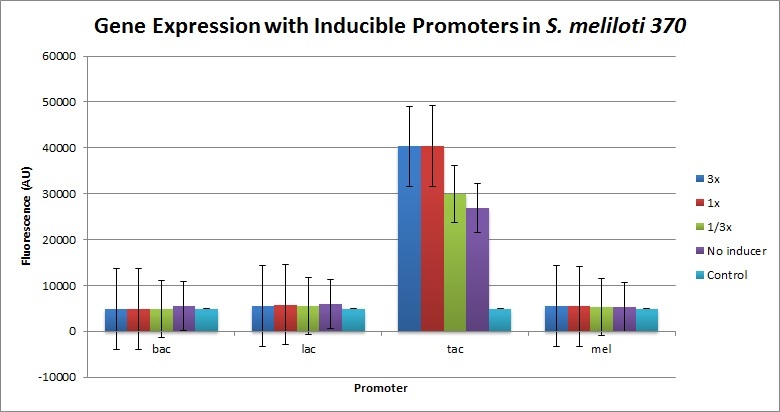 We measured expression using these promoters in E. coli, finding that bacA, lac, tac, and all three anderson promoters all drive expression to different extents. 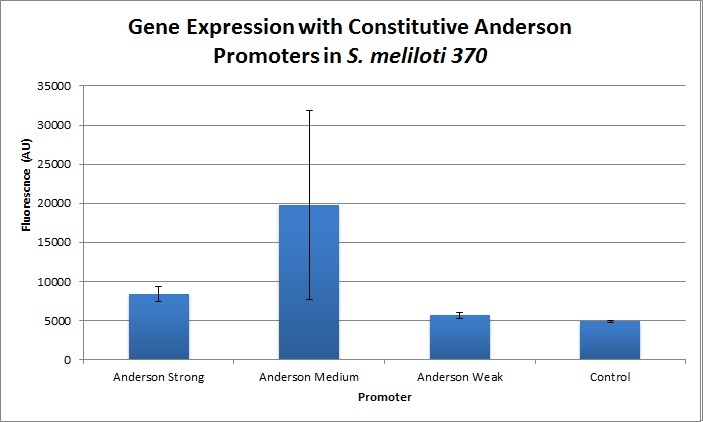 We then successfully transformed plasmids bearing promoter-citrine constructs into S. meliloti, finding successful expression for tac, Anderson Strong, and Anderson Medium. We further assembled the Anderson Medium promoter to 5 different recombinases and confirmed that they were successfully transformed into S. meliloti. MAGE experiments are underway. Our constructs have been confirmed by sequencing in pKT230, a broad-host range plasmid, and pPZP200, a plasmid that can be transformed into rhizobium and agrobacterium. The anderson weak-citrine and S-RSM4 single stranded binding protein constructs have been sequenced in the biobrick constructs, while sequencing for the other constructs is being done. We also determined that BBa_K125000 does not have the advertised sequence, even as it does contain the spectinomycin marker and could also independently replicate in E. coli, as determined by our electroporation experiments. Balkin, J.M. "How New Genetic Technologies Will Transform Roe v. Wade", 56 Emory L. Rev. 843 (2007). Cong L, Ann Ran F et al. "Multiplex Genome Engineering Using CRISPR/Cas Systems." Science2013 339 819-823. Culligan, K., Meyer-Gauen, G., Lyons-Weiler, J. & Hays, J. Evolutionary origin, diversification and specialization of eukaryotic MutS homolog mismatch repair proteins. Nucleic Acids Res.28, 463-471 (2000). Gaj, T., Gersbach, C. & III, C. ZFN, TALEN, and CRISPR/Cas-based methods for genome engineering. Trends in Biotechnology31, (2013). Gallagher RR, Li Z, Lewis AO, and Issacs FJ. "Rapid editing and evolution of bacterial genomes using libraries of synthetic DNA." Nature Protocols2014 9(10) 2301-2316. Gilbert, Natasha. "African Agriculture: Dirt Poor." Nature 483.7391 (2012): 525-27. Web. Hamilton JJ and Reed JA. "Identification of Functional Differences in Metabolic Networks Using Comparative Genomics and Constraint-Based Models." PLOS One2012 7(4) 1-19. Hsu, P., Lander, E. & Zhang, F. Development and Applications of CRISPR-Cas9 for Genome Engineering. Cell157, (2014). Hungria M, Andrade DD, Chueire LMD, Probanza A, Guttierrez-Manero FJ, Megias M. Isolation and characterization of new efficient and competitive bean (Phaseolus vulgaris L.) rhizobia from Brazil. Soil Biol Biochem.2000;32:1515-1528. doi: 10.1016/S0038-0717(00)00063-8. Ludwig M and Bryant DA. "Synechococcus sp. Strain PCC 7002 Transcriptome: Acclimation to Temperature, Salinity, Oxidative Stress, and Mixotrophic Growth Conditions." Front. in Microbiology2012 3(324) 1-14. Lynch, M. D., Warnecke, T. & Gill, R. T. SCALEs: multiscale analysis of library enrichment. Nat. Methods4, 87-93 (2007). Mali P, Yang L et al. 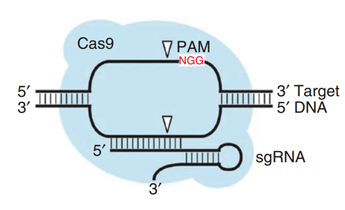 "RNA-Guided Human Genome Engineering via Cas9." Science2013 339, 823-826. Martinez-Romero E, Segovia L et al. "Rhizobium tropici, a Novel Species Nodulating Phaseolus vulgaris, L. Beans and Leucaena sp. 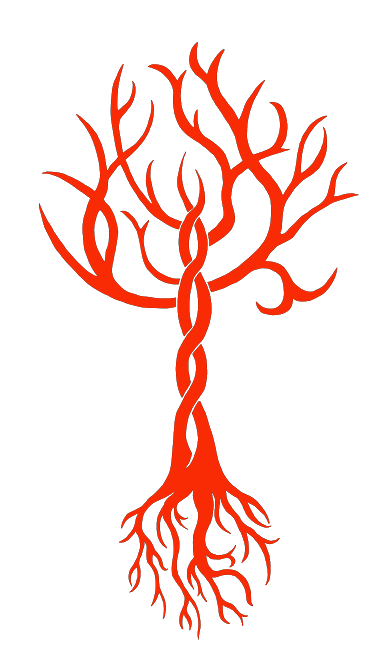 Trees." Int. J. of System. Biotech.1991 41(3), 417-426. Martínez-Romero E, Segovia L, Mercante FM, Franco AA, Graham P, Pardo MA. Rhizobium tropici, a novel species nodulating Phaseolus vulgaris L. beans and Leucaena sp. trees. Int J Syst Evol Microbiol. 1991;41:417-426. Moron B, Soria-Diaz ME, Ault J, Verroios G, Noreen S, Rodriguez-Navarro DN, Gil-Serrano A, Thomas-Oates J, Megias M, Sousa C. Low pH changes the profile of nodulation factors produced by Rhizobium tropici CIAT899. Chem Biol. 2005;12:1029-1040. doi: 10.1016/j.chembiol.2005.06.014. "Nitrogen Fixation by Legumes." Nitrogen Fixation by Legumes. New Mexico State University, n.d. Web. 02 July 2015. Ormeño-Orrillo, Ernesto et al. "Genomic Basis of Broad Host Range and Environmental Adaptability of Rhizobium Tropici CIAT 899 and Rhizobium Sp. PRF 81 Which Are Used in Inoculants for Common Bean (Phaseolus VulgarisL.)." BMC Genomics 13 (2012): 735. PMC. Web. 28 Aug. 2015. Ruffing, A. 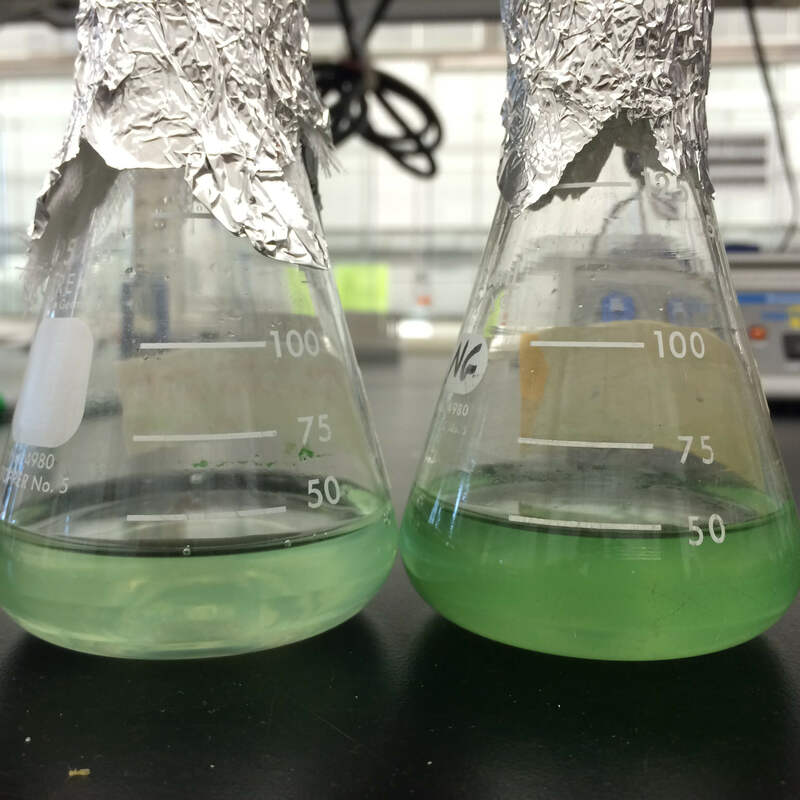 "Improved Free Fatty Acid Production in Cyanobacteria with Synechococcus sp. PCC 7002 as Host." Front. Bioeng. Biotechnol.2014 2. Song HS, McClure RS, Beliaev AS et al. "Integrated in silico Analyses of Regulatory and Metabolic Networks of Synechococcus sp. PCC 7002 Reveal Relationships Between Gene Centrality and Essentiality." Life2015 5(2) 1127-1140. Wang, H. et al. Programming cells by multiplex genome engineering and accelerated evolution. Nature460, 894-898 (2009). Widger WI, Chen X, and Samartzidou H. "Synechococcus PCC 7002." In Bacterial Genomes: Physical Structure and Analysis. De Bruijn FJ, Lupski JR, GM Weinstock, Eds. Springer US: 1998, 763-770. Xu Y, Alvey RM, Byrne PO, Graham JE, Shen G, and Bryant DA. "Expression of genes in cyanobacteria: adaptation of endogenous plasmids as platforms for high-level gene expression in Synechococcus sp. PCC 7002." Methods Mol. Biol.2011 684, 273-293.